Today was so exciting! Social Networking in school who would think. Today we learnt about using sites like twitter, facebook and bebo properley using a really cool website could Twiducate. We recommend everyone using it. Our teacher can see all of our profiles and we are not live to the public, but we can post to each other without the world seeing. We have discussed why we need to use standard english and the types of posts that we may create. HI is not a good post. Here are some of our thoughts on why it should be used in the classroom. Twiducate is fun because it is just like facebook were you can write something on your wall. It is cool because it is just a simple website when you can do anything. 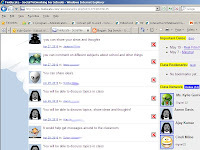 I think that Twiducate is an awesome website to communicate with one an other, and it very easy to use. dealt with immediately based on how acute, sub acute or chronic the case may be.